Snuggled between Downtown Orlando to the North and a large hospital complex to the south, this mid range hotel completed last year certainly doesn’t have any problem staying fully occupied. One of our great A&D teams based out of Tampa worked with the interior design firm on this project, who were looking for a durable wall finish for the long central corridor of the first floor, but also had a specific color range they needed to stick to. Our Ochre Blend XL Series Panel was originally under consideration, but after an initial round of feedback with the design team, they were looking for something a little lighter and more vibrant in color, so we took a risk and showed them a product that we had only prototyped to that point, our Aztec XL Stone Veneer panel. It was a perfect match color-wise and so we set our production team off to the races to complete the order in time for the grand opening. With a small lobby, the dominating feature of the first floor of this hotel is the long corridor which runs from the front entrance, past the elevators and conference rooms, to the rear of the hotel where most of the parking is located. The design team knew this was going to be an important space – visually it needed to be welcome and interesting, and from a performance standpoint it needed to look great day in and day out. The Aztec stone veneer was a perfect choice because its light earth tone color pallete is nice and bright and the durability of stone is unmatched in a commercial environment. Incidental contact with a baggage cart will mark, scratch, and dent popular wall coverings like painted drywall or wallpaper, making stone veneer a great choice for long term commercial durability. Color-wise the Aztec also fit into the scheme of the other surface materials. The somewhat nontraditional choice of a light olive base wall color complements the lighter earth tones of the Aztec stone veneer. The light colored flooring is an excellent choice to match the stone and keeps everything bright and the dark wood stained trim does a nice job as an accent color and to create definition between the flooring and the wall. 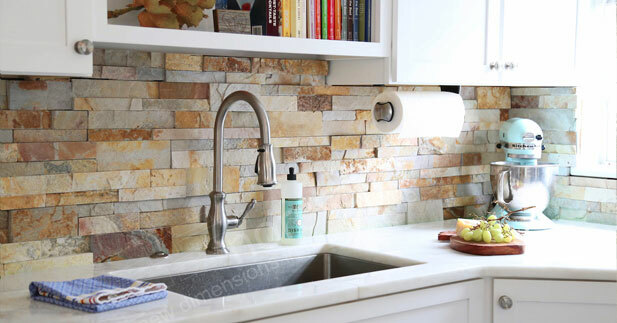 Lighting natural stone walls is something we can never overstate the importance of – it can make a space go from normal to amazing with the flick of a switch. The design team knew that even though this hallway would be well lit up 24 hours a day, some extra attention in the form of directional recessed can lighting can make a huge impact. The texture of the stone veneer really comes out with the lighting and when looking at the stone head on. A small but important detail that mainly goes unnoticed is the nice baseboard that separates the stone veneer wall and tile flooring. While the color creates great contrast and definition, the practical aspect of this baseboard, functioning to keep the chemicals and other cleaning agents used to clean the floor off the stone on the wall is priceless. Commercial spaces, like this hotel lobby / corridor, first and foremost needs to be practical in both everyday and long term use. 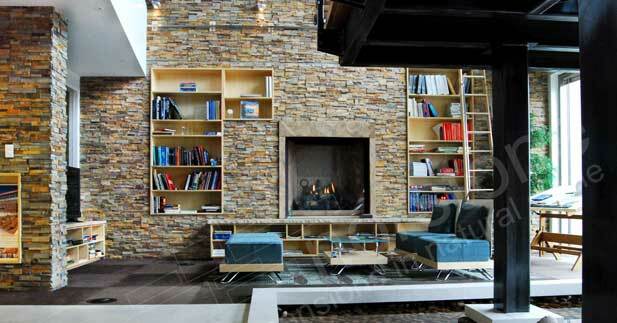 A great design team, like the one on this project, sweats these details and their clients love them for it! We sure were pleased this project came around to kick start the production and promotion of our Aztec XL Stone Veneer into a product we actively sell and stock in all of our US warehouses. It’s a great color and is great alternative to our Ochre Blend color, for projects that still want to stick with the neutral earth tones, but want an overall lighter and brighter look. Learn more about our Norstone stone veneer products today, request a sample or a quote, and let’s talk about how Aztec might be the color for your next stone veneer project!